By now most of our R&H Theatre Library customers will have received our new catalogue of musicals available for production. Creating a new catalogue is a sometimes exhilarating, frequently daunting exercise we put ourselves through every so often because we're eager to tell you about the new shows we have acquired, and because we want to remind you of the others, tried-and-true. The process is exhilarating because it's creative, and because it gives those of us who work with this material daily an opportunity to focus afresh on what it is we represent. (It's easy to feel an incredible sense of pride by association.) It can be daunting because assembling the catalogue is a lengthy process and certainly not without its own sense of drama: this time around it was an eleventh hour call to "stop the presses" so that we could include the most recent musicals for which we had just closed deals. But a really good show is always worth the wait. FOOTLOOSE burst onto the silver screen in 1984 and proved to be one of the year's most successful motion pictures, and one of the last movie musicals to achieve the status of a certifiable hit. Generating a soundtrack recording that reached number one on the Billboard charts and has sold over 15 million copies to date, the Oscar-nominee spawned such Top 40 hits as "Let's Hear It For The Boy," "Almost Paradise," "Holding Out For A Hero" and "I'm Free ( Heaven Helps the Man)." With a screenplay and lyrics by Oscar winner Dean Pitchford, the story focuses on young people, as does his previous, wildly successful movie musical, FAME. The journey FOOTLOOSE has taken from screen to stage is highly unusual. Most often it is a theatrical producer who goes to a movie studio or screenwriter in hopes of acquiring the rights to bring their work to the stage. But with FOOTLOOSE, the writer came to us. Dean Pitchford called our offices one day looking for a little friendly feedback: he sensed that his screenplay, with its contemporary score, might make a good property for the stock and amateur market. We agreed that his idea had plenty of promise, and so off to work he went. Pitchford engaged theatre director David Saint to collaborate with him on adapting the screenplay for the stage; he secured Brian Besterman to create the musical arrangements and Broadway staple Steven Margoshes to create the orchestrations. The stage adaptation retains all of the songs from the motion picture complemented by four new ones by Pitchford and composer Tom Snow, whose songs for the film include the Oscar nominee "Let's Hear It For The Boy." When the adaptation was completed, Pitchford decided to take it a step further by producing a workshop of the musical so that he and his collaborators could get a look at it on its feet, assess and refine their work. 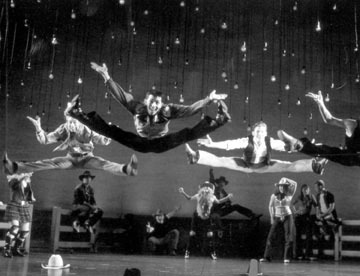 Lynne Taylor-Corbett, who created the dynamic choreography for the film, was enlisted to assist in staging the workshop, and nearly two dozen performers were gathered at a rehearsal studio in Manhattan for two weeks last spring. What emerged is a stirring and beautifully crafted new musical, long on exuberance and heart, and one we feel is destined for many, many seasons of success in the professional and non-professional markets alike. HEARTBEATS is Amanda McBroom's loving and knowing paean to the modern woman. Facing the double-whammy of the big 4-0 and her 20th wedding anniversary, Annie looks back at her life suspecting fulfillment has passed her by. McBroom, whose pop standard "The Rose" catapulted her to the top of the charts, has fashioned more than twenty of her songs into an intimate musical portrait of self-discovery. The score includes the rapturous "Ship In A Bottle," (most recently recorded by Barbara Cook), and the chart-topping "Anyone Can Do The Heartbreak." HEARTBEATS has had tremendous success in regional stagings (the CD of the Pasadena Playhouse production is available from Varse Sarabande #VSD-5527), and we are extremely proud to announce its general availability for production. 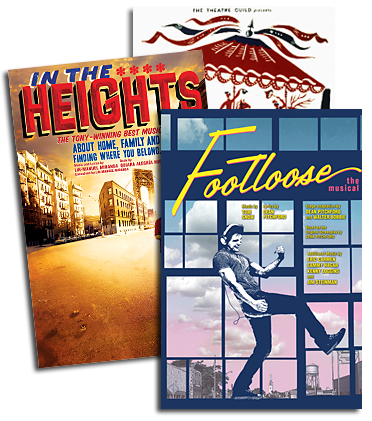 For perusal copies of FOOTLOOSE and HEARTBEATS, as well as our other musicals available for production, please contact us at the R&H Theatre Library and we'll be happy to assist. Meanwhile, we've already begun scouting a few more items for our next catalogue. The R&H Theatre Library: 229 West 28 Street, 11th Floor, New York, NY 10001. Phone (212) 564-4000; Fax (212) 268-1245.